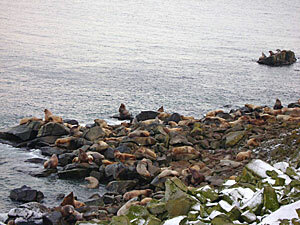 Steller sea lions hauled out on rocks east of Sivuqaq Mountain during late October 2009. Though sea lions are known to haul out in other parts of St. Lawrence Island, use of this location near Gambell is a relatively new phenomenon. Photo by Gerard Koonooka. Steller sea lions will be surveyed at three remote sites in the Bering Sea: Cape Newenham (northern Bristol Bay), Amak Island (Bering Sea), and Sivuonok near Sivuqaq mountain on St. Lawrence Island (a cooperative effort with the Gambell IRA Tribal Council and Sivuqaq Native Corporation). Additionally, long-term data collection at Round Island in Bristol Bay will be supported with this grant. Surveys during this 3-year project will include counts, photographs of branded animals, and documentation of sea lions entangled in marine debris. Photo-documentation of branded animals will help us estimate age-specific survival and dispersal rates, and describe distribution patterns. Documentation of sea lions entangled in marine debris will help us evaluate effects of commercial fisheries. Previously, few surveys have been conducted at Cape Newenham and none at Sivuonok; of particular interest is the country of origin and natal rookery of branded animals seen at these sites.